Explore advantages and top features of Bosch tankless hot water heaters, including the most innovative models and top sellers. An expert review of gas and electric Bosch water heaters, including popular series; Therm, Greentherm from gas and Tronic from the electric group, all designed for on-demand heating of potable water in residential and light commercial applications. As the water heating is the second largest energy user in one household, buying the energy-efficient, or even better – Energy Star unit, is the way to go for the homeowners. And this is where purchasing a Bosch tankless comes in place. Bosch manufacturer offers endless hot water on demand, reduced energy consumption and savings on heating cost up to 50%, also space saving and reduced gas emission. Also, by buying the condensing unit, with the efficiency of over 90%, savings are even higher. Note: The most advanced model from Bosch, Greentherm 9000, released in 2017, could achieve the “industry highest” energy factor of 0.99 and thermal efficiency of 100%. 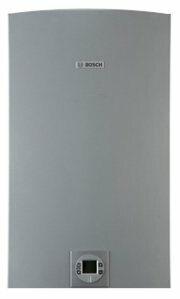 Also, let’s not forget that the average life expectancy of the Bosch tankless is over 20 years, the warranty is 15 years and that models offer some fantastic features such as the innovative technology and advanced electronics that provides stable and accurate temperature and diagnostics. Bosch is a German manufacturer of HVAC products for residential and commercial applications, building quality products from 1886. In North America, you can find several brands in the tankless category, as mentioned above, while in Europe, Bosch tankless hot water heaters are known as Junkers. Popular Aquastar and Powerstar models are discontinued, and these got replaced by the Therm, Greentherm and Tronic brands. When comparing to the old Aquastar and Powerstar, the new Greentherm and Therm series are much more advanced, safer, reliable and durable, and with the more significant energy savings. Tankless heats water on demand and saves up to 50 % on heating costs. For those homeowners who prefer fresh water always, available any time and in an endless supply, the tankless technology is the solution. Since tankless heaters do not have the standby heat loss, water is not stored inside the tank and heated when there is no demand; you will see great savings right after the first month of using. Also, you don’t have to wait for the water tank to fill up and then heat and deliver or recover from the previous use. With the tankless, hot water is heated directly and is available almost immediately. As some will complain that the flow rate is limited, some manufacturers offer a solution by linking two or more units into one system and therefore provide more hot water. Also, if it takes longer for hot water to get to the tap, Bosch offers tankless models with the circulation pump built-in, and recirculation system. Even if they fail, with the 100% serviceable parts, you can replace the malfunctioning component instead of through it out on the landfill, as it would happen with the tank-type model when it is leaking. Yes, they cost more than the conventional type but they last longer, have lower operating and energy costs, are more convenient to use, provide enhanced comfort, and overall experience is better. Both Therm and Greentherm group of gas tankless water heaters come with the built-in digital control panel that allows not only monitoring the temperature rise but programming with the precise temperature adjustment and safety control. Models from Greentherm 9000 series are even more hi-tech as they utilize Wi-Fi connection for increased control. Also, thanks to the dual fan, modulating vertical burner and built-in turbulators, the units can operate more efficiently and last longer, as the scale build-up would get reduced. For homes with the high hot water demand, or commercial applications, up to 24 models (some models), either Therm or Greentherm can be linked together in cascades. For those who prefer instant hot water delivery, heaters that utilize the recirculation pumps could be worth considering, as they make recirculation easy. All the models are compact, lightweight and wall-mounted which makes them easy to handle and install, and save the floor space for other use. Bosch Therm series is the newer line of the advanced condensing and non-condensing tankless water heaters that come with the energy factor that can reach high 98% and a minimal amount of heat loss (around 2%). Our focus will be on water heaters for residential use. Most of the models are non-condensing that come with the power range from 74,900 to 199,000 BTU, and efficiency up to 83%. Also, there are three models with the condensing technology and the power ranging from 175,000 to 225,000 BTU, and ultra-high thermal efficiency up to 98%. Some models with the reviews are shown in the list below and via the appropriate links. Therm condensing models with the low NOx gas emission are environment-friendly and due to the high efficiency - Energy Star compliant. In the residential application, they can heat water up to 140 F, while in commercial up to 184 F, making it ideal for restaurants and hospitals. The smallest models, such as 330 and 520 series have a simple design; they utilize the piezo ignition and high-to-low temperature option. Here is the list of the available models, ranked from the low and mid-efficiency to the most advanced with the high energy factors. The Bosch C 1210 ES, which is reviewed here in details, is the largest and most advanced model that can deliver more hot water to demanding applications due to its flexibility to work in the Cascade setup and with other model types (solar and electric). 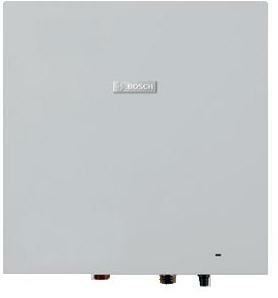 Bosch Greentherm models are tankless and condensing gas water heaters that are operating with the ultra-high thermal efficiency of over 94% and utilize several innovative features such as the modulating gas valve, active bypass and intelligent electronics for the maximum performance, temperature stability and reliable operation. All the models, either installed indoor or outdoor have low NOx gas emission, and are Energy Star compliant, resulting in the flexible installation, reduced pollution, and fantastic energy savings. Due to the lower temperature of exhaust gases, Greentherm models can use affordable and easy-to-install PVC or PP vents, using the concentric setup. The smaller Greentherm C 950 ES comes with the power of up to 175,000 BTU and water flow of 9.2 GPM (35 F rise) and larger Greentherm C 1050 ES with the power of up to 199,000 BTU and flow rate of 10.5 GPM (35 F rise). The Greentherm 9000 series is the latest group of tankless and condensing water heaters from Bosch. There are seven models in this group, all with the high energy factor of up to 0.96. They come with the “industry leading” turn down ration of 22:1, heating water from the lowest gas input of 9,000 Btu to the highest 199,000 Btu. With the state-of-the-art design, the Greentherm 9000 with the use of a Wi-Fi connection and corresponding app, you can remotely activate the recirculation pump, check out the energy usage and control the temperature. Both models come with a warranty of 15 years. Bosch Tronic is the series of small electric tankless water heaters designed for the whole-house and point-of-use applications, such as smaller homes, apartments, and cottages. The largest model WH36, from 5000C series, provides endless hot water to up to 3 major applications. They are designed small and compact, allowing installation virtually anywhere inside the home or business, while the powerful and efficient heating elements ensure plenty of hot water. Tronic 6000/5000 – available in three sizes (WH36, WH27, and WH17) that can be used for the whole-house application. Tronic 3000 – available in five sizes from US3 to US12 and are known as under-sink or point-of-use (POU) models, and mostly one fixture. Tronic 3000T – available in three tank sizes ES2.5, ES4, and ES8 and are also design for point-of-use service. The largest electric model WH36, with its 36 kW of power can provide endless hot water to up to 3 major applications. Designed small, lightweight (26.5 lbs.) and compact, they can be installed virtually anywhere inside the house, and due to its powerful and efficient operation, they can be used in whole-house applications. The warranty on the Bosch electric water heaters is 5 years. Bosch tankless water heaters, no matter are they powered by gas or electricity, utilize many advanced features and sophisticated technologies, resulting in superior on-demand water heating, lower operational cost and ultimate pleasure with an endless supply of hot water. Due to the tankless design and with the built-in modulation, they can ensure the constant temperature and enhanced comfort. Mini tanks on the other side are used mainly for point-of-use applications and for small jobs, as they produce only low volumes of hot water.